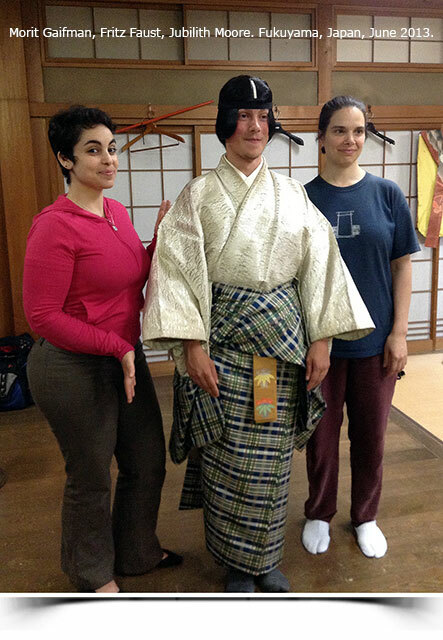 Contributed by Fritz Faust, 2013 Costume Workshop participant. Time is passing and I can nearly see it running away from me. It is a good feeling as all good things go by so quickly. The first three days in Kyoto full of sun and information are also full of experiences that will stay in my mind. First there is the feeling of being in Sasaki-san’s weaving room in the midst of hundred year old silk looms, the turning of the spinning wheels and all the colors of the cloth and threads, with a very special smell that I already forgot. Then the traditional Japanese room, in which the costumes are seamed together by a very nervous woman, not accustomed to having an audience, with a wonderfully simple way to answer questions and show us her handicraft. The hours in the Medieval Japanese Studies Institute passing like a flash, us five students weaving, embroidering, applying gold and colors, and Monica Bethe, who explains simply everything with a lot of energy in a tangible and sensitive way: the history of the costumes, how they were dyed, which form they have, how they are combined, and more. In the Nagakusa Embroidery, a villa free from the hot air of Japanese summer, very sweet sweets and a bitter refreshing tea, in which we learned besides embroidery also about the connections of Kyoto society, the connections which are not so apparent in art and handicraft, but which you get a faint idea of when speaking to Kyoto people. Me at Kyoto central station, on the way to Fukuyama, being split from the rest of the group, trying to decipher the train information in Japanese, without a mobile phone or even a telephone number. The releasing view of Jubilith, who takes me to Fukuyama, fully aware of the train connections. 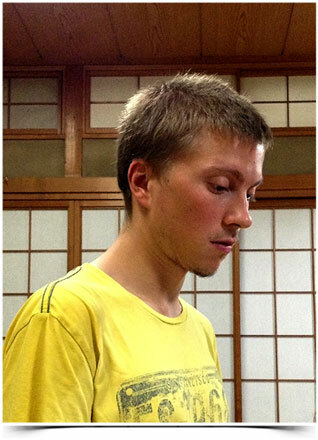 An incredible rehearsal in the No theatre in Fukuyama. A first try to clothe someone in a No costume, pull up, adjust the edges, fold three times, fold two times, wrap around, tighten right and left, right over left at the backside, pull through behind everything, two times, lock it, loop. Being watched and taught by the Oshima familiy, who invited us warmly to their theatre; you can sense that they really care about people and things surrounding them and treat them gently and with respect. So far a lot of experiences to think about, but these moments will definitely stay. 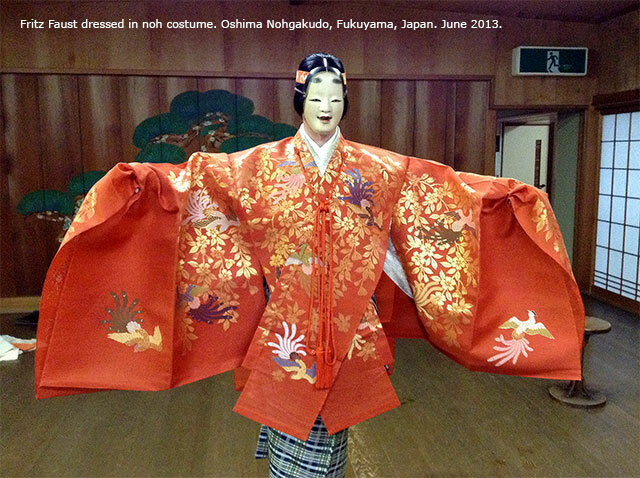 This entry was posted in Costume Workshop, Workshops and tagged fritz faust, jacquard loom, jubilith moore, kyoto, medieval japanese studies institute, monica bethe, morit gaifman, noh costume workshop, oshima nohgakudo, sasaki noh ishou, theatre nohgaku, 佐々木能衣装. Bookmark the permalink.